1. EPIPHYSIS - ends of bone, articulates (forms a joint) with another bone. 4. PERIOSTEUM - tough membrane-like covering over entire bone. 5. 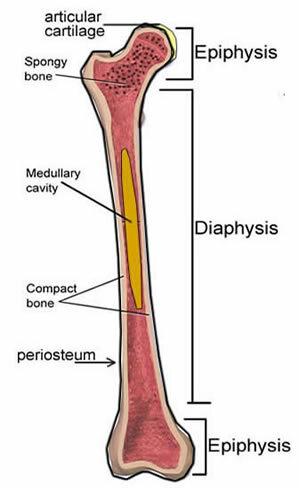 MEDULLARY CAVITY - hollow chamber within the diaphysis connects to spaces in spongy bone. Filled with soft specialized tissue called bone marrow. 2. SPONGY (cancellous) BONE - epiphysis. HAVERSION CANALS & VOLKMANN'S CANALS provide passageways for blood vessels. 2. Endochondral bones = all other bones. Bones first form as hyaline cartilage. The cartilage then gradually changes into bone tissue - a process called OSSIFICATION, which begins near the middle of the diaphysis in an area called the PRIMARY OSSIFICATION CENTER. 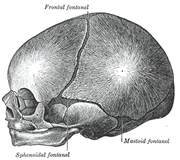 Later the bone begins to ossify in the epiphysis - these areas are called the SECONDARY OSSIFICATION CENTERS. As long as growth is occurring, a "band" of cartilage (called an epiphyseal disk, growth plate) remains between the diaphysis and the epiphysis. Bone tissue is constantly being replaced as special cells called OSTEOCLASTS dissolve bone tissue from within the medullary cavity - a process called RESORPTION. 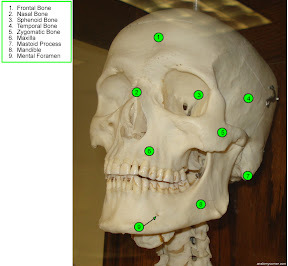 At the same time new bone tissue is being added to the outside of the bone. 3. DIARTHROTIC - freely moveable joint, have a lubricating fluid called SYNOVIAL fluid. Arms: Upper arm - humerus. 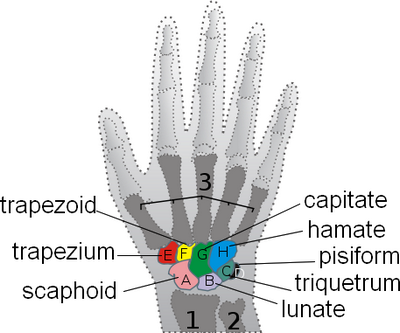 Lower arm - radius and ulna. Legs: Upper leg (thigh) - FEMUR. 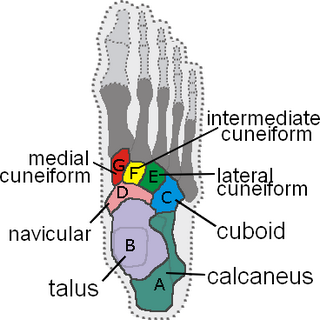 Lower leg - tibia & fibula. A single fracture is when the bone is broken in one place. An open fracture is when the bone is sticking through the skin.